Just like the twinkling blooms of southern Star Jasmine, singer Holli Mosley’s voice infuses the air with sweet, sultry melodies that are taking this artist straight to the top. From opening the stage for the likes of Jason Aldean, Blake Shelton & Travis Tritt and into the hallowed halls of Muscle Shoals’ FAME Recording Studios, Holli has positioned herself alongside some of the most venerated southern rock & soul performers of the last 50 years. Under the tutelage of FAME Studios President Rodney Hall, Holli is perfecting her sound with hand-picked writers and seasoned session players dubbed the new FAME gang – a modern day version of the studio’s legendary rhythm section. The combination of Holli’s soulful lyrics, powerful voice and company she keeps will make her first single and EP, due out in 2016, the one to watch. Capturing the essence of the Muscle Shoals’ sound, Holli is recording in-studio with The Swampers – the original FAME band members that helped put the town on the music industry’s map. Collaborations on the album feature guest writers and performances by The SteelDrivers’ lead vocalist Gary Nichols, Larry Byrom of Steppenwolf fame and Grammy Award winner John Paul White, formerly of The Civil Wars. Holli’s musical talent is seemingly genetic, passed straight down through her grandfather’s country & bluegrass lineage, directly into her soulful sound. At the tender age of 8, she knew she wanted to sing, began competing and has been climbing the ranks ever since. Crediting country as an early influence in her life, Holli now looks to southern rock & soul as a source of inspiration. 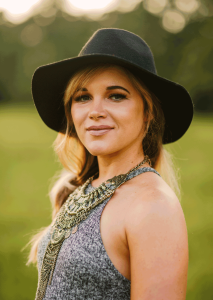 As her musical tastes have matured, so has Holli’s voice – the result of which leaves her a rising star on the Country and Americana landscape. Her drive and determination has taken her from humble beginnings in Mobile, Alabama to opening for major music industry stars. In 1996 Holli was chosen to sing the National Anthem at the Mobile BayBears baseball game at the age of 9. In 2000, at the age of 13, she placed second in the entire nation after representing the State of Alabama in the National Singing Championship in Nashville, Tennessee. That same year, Holli became the youngest person to win the Mississippi state title in the Colgate Country Showdown, the largest talent search for country artists in the nation. In 2003, Holli competed against 200 people from across the Southeast and won the chance to sing the National Anthem during the NASCAR race at the Talladega Speedway. In 2004, she was invited back to sing on national television during the NASCAR BUSCH Race on FOX. In 2005, she was chosen to sing the National Anthem for her hometown Senior Bowl, an annual invitation-only football showcase for the best college football players in the country. 2007 & 2008 represented her biggest breaks to date, as Holli opened the stage for Jason Aldean, Clay Walker and Rhett Aikens. In 2010, Holli competed with over 1,500 people at the Wind Creek Casino in the “Sing Your Way To $100k” contest, took second place and a $10,000 award. It was there where she was discovered by FAME Studio heir and President Rodney Hall. Her recognition also put her in front of larger markets when she opened for country superstars Travis Tritt, Blake Shelton and Colt Ford later that year. Holli was signed as a new artist with FAME Recording Studios in 2013 and her new band was formed. Her first single is due out in 2016.